3″ Doctor Who Vinyl Collectibles – Wave 5: Gallifrey. Licensed by the BBC and Titan Merchandise and curated by artist Matt Jones aka Lunartik, TITANS amazingly sculpted vinyl statues are perfect for both fans and collectors alike. In most shops they are sold in blind boxes (you never know what figure you’d get) but we have removed the risk for you and carefully opened each one to reveal the character inside. 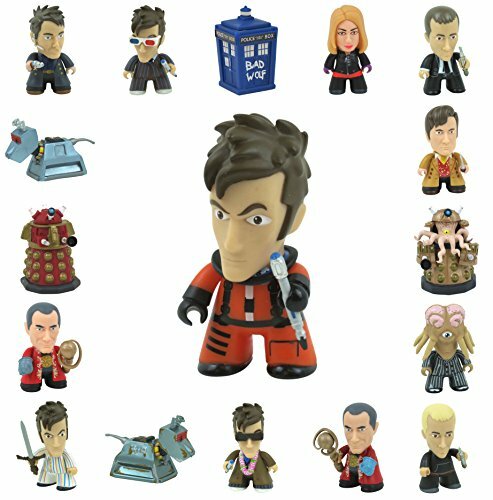 This collection is Wave 5 – Gallifrey. In addition to the 12 main figures, occasionally one of the “super-rare chase figures” (a depiction of one character from a certain era or look) pop up – their chances are indicated by the distribution ratio stated beside each figure (e.g. one in forty, 1/40 is twice as rare as 1/20). One figure supplied. Figures come with the original foil and themed box (both opened), have articulated arms and head, and may include character specific accessories. One figure supplied – choose your character! Figures come with the original foil and themed box (both opened), have articulated arms and head, and may include character specific accessories.